A toast to our excellent adventure! 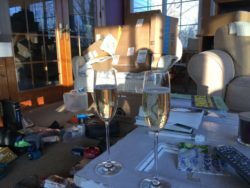 We have been so busy getting our life organized to be away for 6 months that we haven’t had a chance to open all of the packages that have piled up,filled with gear. While some people may be going out on Saturday night, we poured some champagne to toast what will hopefully be our excellent adventure, and delighted in opening our packages. It was better than Christmas!! We tried out our Gravityworks water filtration system, our merino buffs, and compasses. We need to go through our lists to make sure everything we ordered has arrived. Our Delorme personal locator beacon has yet to arrive and I am anxious to see how it works and to choose the subscription plan. Any feedback from other hikers on this would be appreciated. We also decided to buy sleeping bag liners at the last minute. I really like the idea of keeping my sleeping bag clean, and being able to use it as a sheet of and when I get too warm. From the looks of posts from bloggers that have already hit he trail, being too warm isn’t going to be an issue anytime soon. So far we are really pleased with most things we purchased, except that my crocs are too small! My name is Tortugamama (Tortuga was taken), and Grey Hare and I are recently retired and are very excited to be starting our adventure on the AT. We will be flip flopping beginning in Virginia on April 10. We are life-long outdoor enthusiasts and look forward to hearing from our family and friends, old and new, along the way. Any words of advice will be greatly appreciated!